With all the rumors about Huawei's upcoming flagship phablets lately, we still know nothing about prices. Well, thanks to a fresh new report, that gap in our Mate 20 and 20 Pro knowledge is now fixed. 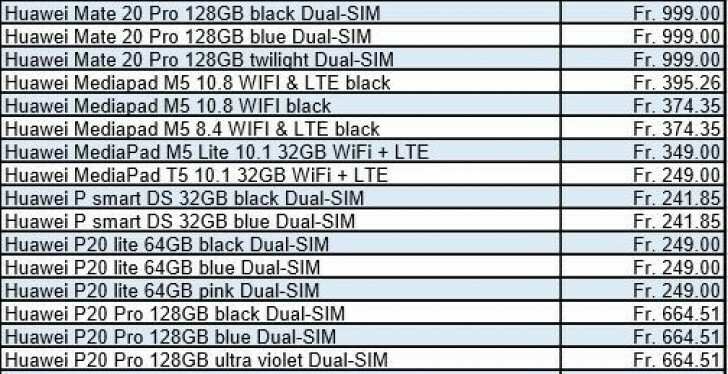 The pricing list contains other phones as well and comes in Swiss francs. Also, note that these prices are from the local distributors to retailers so the end customer will end up paying a few bucks extra. The regular Mate 20, for example, ships for CHF 799 or in other words - $806 for the 128GB version coming in black, blue and twilight colors. This means that the end pricing will be hovering between $850 and $900. As for the Mate 20 Pro, you will have to dig even deeper into your pockets. The distributor's asking price is CHF 999 ($1,008) so a final price of $1,100 isn't too far off. That's, of course, for the 128GB model in blue, black and twilight. Another important thing to note here is that the prices are obviously for the Swiss market so they will probably apply for the rest of Europe as well. We will see for sure during the October 16 event in London.